GLIN Castle is open for business again and style icon, style shaper and Vogue editor Anna Wintour is about to visit. 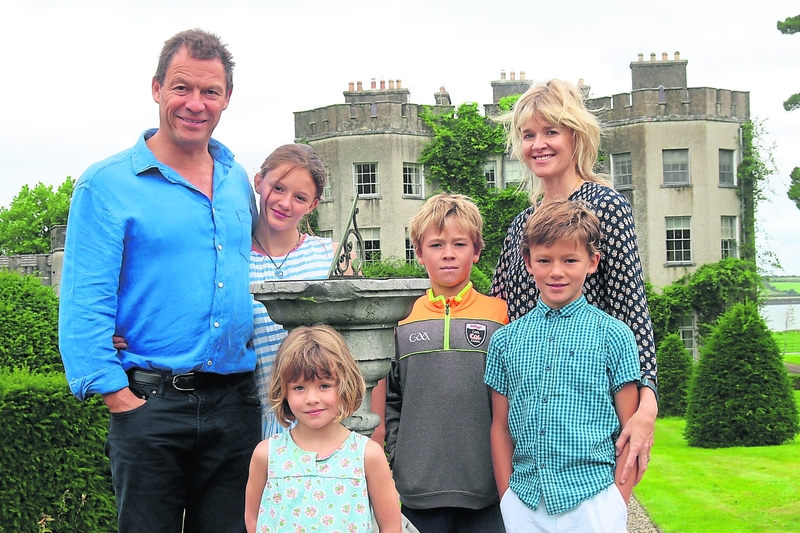 “It is a bit daunting,” film and TV star Dominic West admitted with a grin this Monday. He and his wife, Catherine Fitzgerald, were back in Glin after a holiday in the US where they had invited Ms Wintour to come and stay. And she who is best known as The Devil Wears Prada said yes, she would love to come. Fresh from jet-lag however, the star of The Wire and The Affair, looked like he was beginning to think it might be a little too much, too soon. “We are really excited and terrified. We are terrified about everything being ok. She is just a brilliant organiser,” he said with his trademark big smile. But perhaps also a little tongue-in-cheek. Somehow, the idea of him being fazed is not easy to fathom. This, after all, is a man who has done the Estuary Swim and who, in 2013, made it all the way to the South Pole with Prince Harry and a number of wounded military veterans. Whoa there a moment! Anna Wintour in Collins’ Seaweed Baths in Ballybunion?! But Dominic has moved on, listing all the other attractions; the Knight’s Walk, picnics on Scattery Island, dinner at Glin Castle itself, golfing. However, it is unlikely he will have one of his dream projects ready for Anna: to paint the outside of the castle and bring it back to its brilliant, gleaming white again. It is all part of a “gentle” strategy to make Glin Castle pay its own way again, and perhaps, perhaps and ever so softly perhaps, restore the title, Knight of Glin to the next generation. Following the death of Desmond Fitzgerald, the 29th Knight of Glin in 2011, it was thought the title had died with him. A little bit of research by academic Declan Downes from neighbouring Tarbert and a long, written treatise on why this should not be so, may open the possibility of an appeal to the Chief Herald. But that is all in the future. Meanwhile, Dominic and Catherine are easing themselves into the role of guardians of the castle. The decision hasn’t been made lightly. The castle was put up for sale in 2015 but withdrawn last year when the idea of redeveloping it as a boutique hotel surfaced again. Their first step has been to resurrect the private leases of the castle, which has proved a success so far this summer and with bookings already in place for Christmas and next year. There has also been a number of high-end Lens and Larder weekends which have brought full houses. But will Dominic soon be a hotelier? “Things like the Wild Atlantic Way really help put Glin on the map,” he continued. “But there has to be a reason for people to pull over and stop.” The closure of the castle, he said, has meant that Glin lost out. And he quotes the chairman of the Glin Development Association, John Anthony Culhane: Foynes has its museum and Glin has its castle. He might also have said: Glin has its castle and Dominic West. “I am not advertised as being in the package,” Dominic protested with a laugh. One project being considered is reviving the Castle lodge on the N69, which was a gift shop and tea shop in years past. “It would be a brilliant tea-shop or restaurant,” Dominic explained. And Glin, after all, he said, was built for parties. “I would love to do everything we want and open it all up,” he continued. But they are, he added, “taking it gently”. There is more than Glin to be taken into account and the logistics of their lives are daunting. Dominic works mainly in the US but their home, with their four children, is in London. Catherine’s landscape gardening work also involves travel. One of her current projects is Hillsborough House in Northern Ireland. Catherine, he added, would love to live in Glin full-time. “But I would have to be semi-retired,” he said. And that is not going to happen anytime soon. But yes, Glin Castle is back in business. Only this time, it comes with a large sprinkling of Hollywood glamour, and the magic star-dust that is Dominic West.